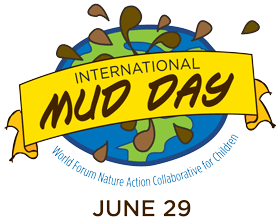 The idea is to encourage kids and adults alike to get out and play...specifically with mud. Well...I couldn't let the day go by without celebrating in some form or another. Although there was no way I was going to play in the mud. I mean, I haven't done that since I was a kid. But, I realize that I'm not just a mother, but a mother of boys...and they LOVE mud. So, I celebrated Mud Day my own way. Pour chocolate chips into a microwave safe bowl and microwave for a minute on high. Stir the chocolate and microwave for another minute or until the chocolate is melted. Spread the mixture out on a sheet of waxed paper. Let the chocolate set overnight. It gets stiff and pliable. when you are done playing, you get to eat a yummy treat. It actually tastes like a tootsie roll. Microwave semisweet chocolate morsels in a small microwave-safe glass bowl at HIGH 1 minute or until smooth, stirring every 30 seconds. Beat butter and sugar at medium speed with an electric mixer until creamy; add eggs, 1 at a time, beating until blended after each addition. Beat in vanilla and melted chocolate. Combine flour, baking powder, and salt; gradually add to chocolate mixture, beating until well blended. Stir in chopped pecans and 1/2 cup milk chocolate morsels. Drop dough by heaping tablespoonfuls onto parchment paper-lined baking sheets. Press 3 marshmallows into each portion of dough. Bake at 350° for 10 to 12 minutes or until set. *Please don't forget to follow this blog on Bloglovin' or like us on facebook since our beloved Google Reader will be going away very, very soon.